Kick in the afterburners and let's see what this card can really do. In the initial GTX 1080 Ti review, I wasn't able to finish all the tests I wanted to include. I've been busy running additional benchmarks, and I have a few updates in the works. For this first piece, I'm looking specifically at the overclocking potential of the GTX 1080 Ti. With higher clockspeeds on the GPU and RAM compared to the Titan XP, you might think Nvidia pushed the card to its limits. Turns out, there's still plenty of junk in the trunk. I didn't do anything crazy here, I just cranked the power limit to the maximum 120 percent, and after a bunch of testing I ended up with a 175MHz increase on the GPU core clock and a 500MHz increase on the GDDR5X—which takes the memory to an incredible 12Gbps. Then I set the fan speed to a static 80 percent, which is certainly audible but really isn't too bad. The above image was captured while running a heavy GPU workload for literally hours—it completed with no crashes, despite the healthy overclock. That was my burn-in result, which had the GPU core settling in at 1900-1950MHz and a temperature of 75C. For gaming workloads, depending on the game, resolution, and settings used, I saw sustained clockspeeds in the 1975-2035MHz range. And the temperatures were much better, typically in the 65-70C range. Running at stock, core clockspeed was usually around 1700-1750MHz, but the fan speed was much lower leading to temperatures as high as 84C. Nvidia has tuned the 1080 Ti by default to keep fan speeds below about 50 percent, so rather than making more noise the clockspeed will drop until the card reaches equilibrium. That's not a bad approach, leaving plenty of room for overclocking—and there will certainly be custom designs that make the most of the headroom. At 1440p, there are several games where the overclock doesn't do much. Doom runs into the 200 fps framerate cap—yeah, at 1440p ultra, it's still running 200 fps. Dishonored 2, Shadow Warrior 2, Ashes of the Singularity, and Civilization VI all show less than a four percent gain. But other games that are more GPU limited definitely benefit, with >10 percent gains in Battlefield 1, Far Cry Primal, Gears 4, Wildlands, and Rise of the Tomb Raider. Overall, performance improves by eight percent at 1440p thanks to overclocking. 4K is more GPU limited, so the improvements are even greater. Civ6 is the only game that sees no real benefit, and a few others also show single digit percentage improvements. But Doom sees nearly a 20 percent improvement, and several other games show impressive gains of 15-17 percent. On average, at 4K performance is up 10 percent—not too shabby! The GTX 1080 Ti routinely bumps into the power limit when overclocked, and you can achieve a decent performance improvement without touching clockspeeds if you just increase the power limit. If you're skittish about damaging a $700 GPU, raising the power limit without changing the clockspeeds is pretty much a 'free' performance boost (with a bit more power use from the graphics card). 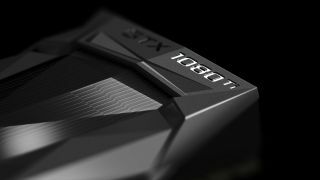 Overall, GTX 1080 Ti is very similar to the rest of the Pascal lineup when it comes to overclocking. It doesn't hit as high of an overclock as the 980 Ti and other 900-series cards achieved, but part of that is due to differences in architecture. Pascal may be similar to Maxwell, but Nvidia did add some new features, and stock clocks are substantially higher. Even with the process shrink from 28nm down to 16nm FinFET, there are still limits to how far silicon can go. Now if only you could find the GTX 1080 Ti in stock…. Just as we expected, all of the places carrying the 1080 Ti sold out in rapid fashion. If you're anxious to get one, the best advice I can give is to keep checking your favorite resellers. For the next few weeks at least, supply isn't likely to keep up with demand, but you might get lucky.